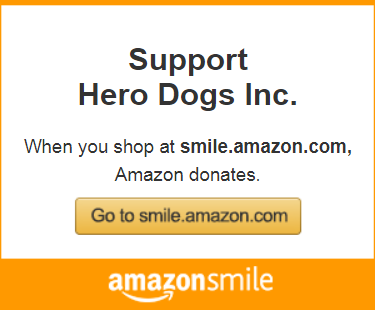 Puppy Raisers: Charlie & Becky M.
Raising Zeke - Hero Dog in Training shared a post. Happy birthday Zeke... Enjoy your big biscuit..we love you!!? So proud of you Zeke! Hello friends! Fall is in the air! I have noticed that it is getting cooler and the days are getting shorter. I do enjoy the cooler mornings but it is dark now when we go out in the morning. I am now 7 1/2 months old and over 60 pounds—all muscle! I have become a really good leash walker— my puppy raisers and I walk 3-4 miles every morning. I am also starting to retrieve balls and frisbees, but to be honest after about 5 tosses I’m done! I have officially graduated from Puppy 2 class. My thesis focused on a series of sit, down, and stand “stays” with an emphasis on “coming when called”, and “ignoring distractions”. I am looking forward to pursing a graduate degree in advanced Hero Dog training! Until then I am attending HD Big Dog classes. I have been to about 3 classes so far and my raisers and I are learning so much! I am working on “touch,wait”, “front”, “place”, “brace”, sit at “heel” and “side”, and learning to go from a sit to a stand without walking forward. Whew! It’s been a busy month! One of my favorite events this month was the Germantown Fire Department open house. I met so many people and heard a lot of different sounds. This is a very important part of my training—the more new experiences the better! Speaking of new experiences....I also went on another road trip this month to Philadelphia. I don’t mind the hotel rooms or change in my usual schedule. I went to a conference with my raiser Dad and did a really good job--I was quite and polite , showed off my skills/commands, and exhibited great Hero Dog behavior all around! Over the month my raisers make sure I have new experiences every week. For me this usually means new parks, shops, restaurants, and Hero Dog events. If I mentioned every one of these I would make you all fall asleep! A few of my adventures this month included a big shopping trip to the Ft. Detrick commissary (usually we just run in for a few items), helping a friend move into their house, and having play dates with my fellow Hero Dogs, like Hero Dogs Jaz. I hear that October is going to be a busy month for us Hero Dogs. I already have several events on my calendar. Please be sure to follow my Instagram @herodogszeke and Facebook “Raising Zeke- Hero Dog in Training” for more updates on my training. Click here to read Zeke’s full blog.